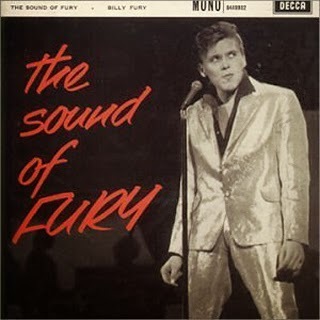 Today’s Album Of The Week is Billy Fury’s “THE SOUND OF FURY”, a 10”, 33 rpm British LP from 1960, all tracks being played from an original copy of that album. Next to that, you’ll hear rock and roll and rockabilly rarities, as well as some more “pearls” from the ACE label. Disque "fil rouge" pour aujourd'hui: le 33T "THE SOUND OF FURY" de l'anglais Billy FURY, un 25 cm de 10 titres paru en 1960, qui est sans doute ce que la Grande-Bretagne a produit de plus proche du rockabilly américain. Outre cet album, qui vous sera présenté dans son pressage original, nous continuerons à explorer le catalogue du label américain ACE, ainsi que celui de ses sous-marques. Vous retrouverez également plein de rock and roll et de rockabilly, interprétés par des artistes inconnus ou, au contraire, par de toutes grosses pointures. 1. Billy ADAMS With The ROCK & ROLL BOYS - "Rock, Pretty Mama"
2. Bob JAMES And The CREATIONS - "As My Heart Is To You"
4. Billy FURY With The FOUR JAYS - "That’s Love"
6. Joe TEX - "Cut It Out"
7. Billy FURY With The FOUR JAYS - "My Advice"
8. The ESCORTS  – Bill ROBERTS - "Cajun Queen"
9. MERCY BABY - "Rock ‘n’ Roll Baby"
10. Frankie Lee SIMS - "Hey Little Girl"
11. Billy FURY With The FOUR JAYS - "Phone Call"
12. Tony CASANOVA - "Yea! Yea! Come Another Day"
13. Billy FURY With The FOUR JAYS - "You Don’t Know"
14. Bozo RATLIFF - "Rock Along Time"
16. Billy FURY With The FOUR JAYS - "Turn My Back On You"
17. Jack STARR - "My Love For You Is Petrified"
18. BO DIDDLEY - "Ride On Josephine"
19. Mac REBENNACK - "Storm Warning"
20. Billy FURY With The FOUR JAYS - "Don’t Say It’s Over"
21. The THUNDERBIRDS  - "Flying Saucers"
22. Hershel ALMOND With Al GOOD & His BAND - "Let’s Get It On"
23. Steve ALAIMO - "She’s My Baby"
24. Billy FURY With The FOUR JAYS - "Since You’ve Been Gone"
25. Billy PERKINS - "Campus Cutie"
26. Jerry Lee LEWIS - "Boogie Woogie Country Man"
27. The STARFIRES - "Linda"
28. Billy FURY With The FOUR JAYS - "It’s You I Need"
29. Winnie STARR And The OMAHA KID - "Baby By Rock"
30. Gene TERRY - "Cindy Lou"
31. FATS DOMINO – "«44»"
32. Earl KING - "Everybody’s Carried Away"
33. Billy FURY With The FOUR JAYS - "Alright, Goodbye"
34. Lucky PLANK - "Hey Hey Baby"
35. Jerry Lee LEWIS - "Jesus Is On The Main Line"
36. Dale HAWKINS - "Back To School Blues"
37. Billy FURY With The FOUR JAYS - "Don’t Leave Me This Way"
38. The BLUE DOTS - "Saturday Night Fish Fry"
39. Louis JORDAN And His TYMPANY FIVE - "Ain’t That Just Like A Woman"
40. Carl PERKINS - "Your True Love"
41. Carl PERKINS - "Boppin’ The Blues"
42. Harpdog BROWN - "Farmer John"